BlogVMware WorkstationWhat is VMware ESXi, vSphere, and vCenter? What is VMware ESXi, vSphere, and vCenter? In this article, we will discuss what VMware vSphere Hypervisor ESXi server is, and we will share its download links for you. VMware is a software company that develops various software and especially virtualization products. VMware continues its leadership in virtualization solutions. VM Workstation, a VMware hosted virtualization program, is used by many people today. VM Workstation is a virtualization program built on the operating system and allow you to run virtual machines on it. Although VM Workstation is a popular virtualization solution, Hypervisor Type 1 virtualization solution is used by large companies or organizations. For example, instead of multiple physical servers within a company / organization, a powerful physical server can be preferred, resulting in more benefits from the system with ESXi, resulting in cost savings. What is VMware vSphere ESXi Virtualization? For more information about VM vSphere, visit https://www.vmware.com/products/vsphere.html. ESXi is one of the components of vSphere and is the most important part of its components. It is also a Linux-based virtualization server and enables you to install multiple Microsoft Server or Microsoft Windows operating systems on a single physical system.In short, all virtual machines install on this server. You need Client software to control and manage the system. For example, you can connect to the server by installing this software on the Windows 10 operating system running on a Laptop to connect to the server. vCenter is similar to the vSphere Client. However, vCenter system is a more powerful and convenient server than Client software. You can install and configure VCenter on a Windows and Linux Server. The main purpose of the VMware vCenter Server is to centrally manage virtual machines installed on the system. In addition, you can manage the resource usage of multiple Host machines with vCenter. VM vSphere Client is a host software and can be installed on operating systems such as Windows 10. You can connect to the server using VM vSphere Client. In addition, the vSphere Client supports the web interface. You can use Internet Explorer to seamlessly connect to the vSphere Client. 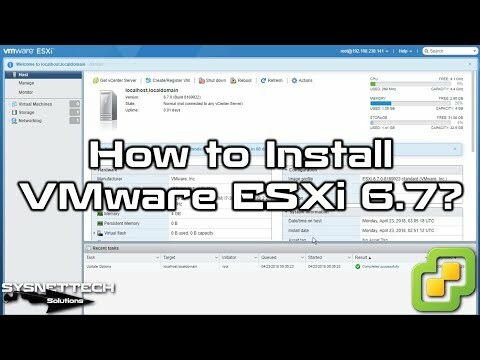 How to Work VMware ESXi Server? You can review the following image to understand the operating logic of ESXi, vSphere, vCenter, and vSpere Client. In the above image, you can see that the ESXi Server installed on the physical server. You can see that virtual machines installed on the server and that vCenter Server installed on a Windows Server virtual machine. The client software is installed on a Notebook to manage the system. It can be connected and managed to the system using the client software. You can also connect to the vCenter system and manage the resource usage of virtual machines in several ways. As a result, the entire infrastructure in the above image is called Software Suite. Where Can I Download VMware ESXi, vSphere, vCenter? After briefly talking about what is VMware ESXi, vSphere, vCenter, you can download the above software from the following links. You can watch the video below to make a step-by-step setup on a virtual computer, and you can also subscribe to our YouTube channel to support us. In this article, we have talked about what is ESXi. In our next articles, we will create new virtual machines on the server and install Windows, Linux, and macOS operating systems on it. Thanks for following us!